The exclusive Pickle-Pro Fermenting Lid that fits all wide mouth canning jars! 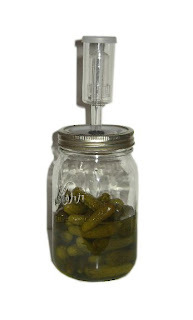 Our set up for Pickle-Pro, allows you to provide your own jars! They will fit any wide mouth quart or wide mouth half-gallon canning jars! We provide the lid with airlock and a rubber seal, you provide the glass jars and the ring to secure it to the jar. No muss no fuss… no broken jars in transit. And best of all, they will fit on all your wide-mouth canning jars! Now when your bounty is fermented, all you do is remove the Pickle-Pro set up, and seal your jar with a regular metal canning lid. We’ve tried to make this as easy as possible. And to get you started we’ve included our recipe for Garlic Dill Pickles! Remember, you can lacto-ferment with a salt brine, or whey, or with cheese cultures like our Abiasa Meso III. And to learn more about lacto – fermentation, check out this great online class by Wardeh Harmen, learn from her by watching videos and receiving her instructions. We even provide the kit for her class, which includes our amazing Pickle-Pro Lids! Slice apples or pears and place in quart jar, top with Blackberries, blueberries or strawberries (even can be frozen fruit) Pour whey over the fruit, leaving 1 inch air space to the top. Seal jar with our Pickle-Pro Lid. Leave on counter for 3 days. 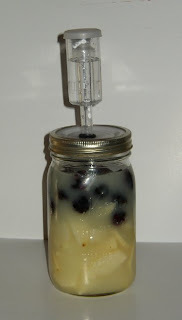 This entry was posted in Fermentation, Homesteading on January 30, 2012 by Homesteader's Supply. It’s time for the sows to give birth to their adorable piglets! For many years now I’ve bought three or four spring piglets for butcher the following fall. It’s not that I needed that much meat… typically I raise two for my freezer and two for my brother and his family. There is nothing like freshly smoked ham or fresh side pork for a Sunday breakfast!! All of the photos of piglets on this blog are pigs I’ve raised. If you’ve never raised pigs, it is a very enriching experience. Despite the reputation for being messy and stinky, pigs are much easier to keep than the cows or a horse. The piglets I buy are usually started in a twelve by twelve pen once weaned and able to consume solid food, though I am notorious for spoiling my piglets with fresh milk from the cow! I build them a straw bale shelter for their piglet months, stuffing the ‘cave’ with loose straw enabling them to burrow in and stay warm on the cooler spring nights. They are always very picky about their pen… never have I had to clean up their house because they pick a corner away from their house and use that for a litter box. This makes it very easy to go out once a day and rake up the few messes into a shovel.. po of… clean pen! I also find the pigs to be very affectionate. The love a good tummy scratch and strong back scratches! How can I raise these little cuties much like a pet and then put them in the smoker… or the freezer??? I get that question a lot. I feel that every animal on the farm serves a purpose… Cookie gives me great milk… her calves offer me meat… the chickens give me eggs and the pigs give me more meat… all are treated with love and kindness. All are given clean pens and a warm place to sleep (or cool if it’s the heat of summer). Each of them gets a great life on my farm and then when it’s time for them to serve their next purpose, I promise them an instant death and thank them for their gift. Some day I hope to be able to keep a sow and raise my own piglets, but for now I depend on others in the area to keep the sows and reserve my piglets in the winter time. While Cookie cow will always be my favorite furry… the piglets are a close second and I really enjoy having them around all summer and into early fall. Have you ever raised piglets? If so, please leave a comment… do you enjoy having pigs? Did you enjoy their gift of fresh tender meat? I’d love to hear from you!! 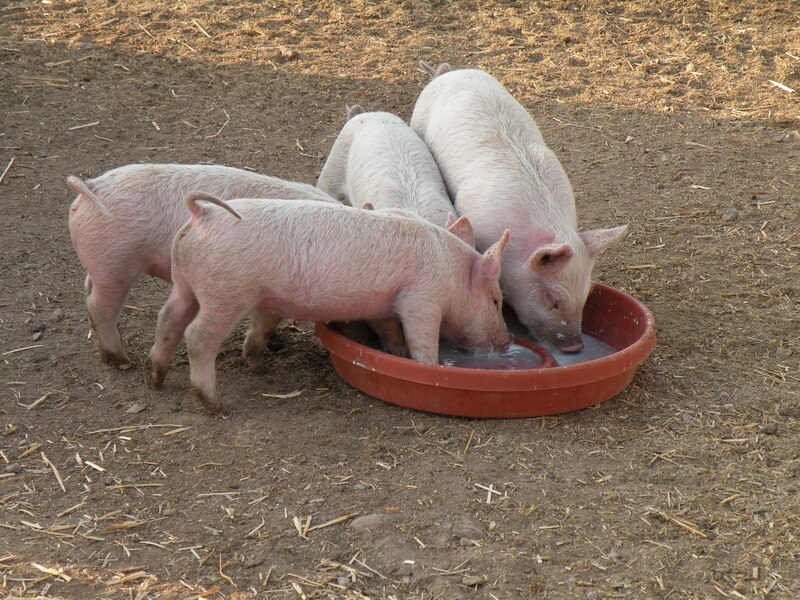 This entry was posted in Homesteading, Pigs on January 26, 2012 by Homesteader's Supply. Bottom line, it was expensive to keep the newsletter service up and running and please all of the readers! I work full time… so Monday – Friday I am gone from the house for nine and a half hours a day… I also have a homestead of my own with Cookie to milk, livestock to feed, poop to rake up and water barrels to keep clean and filled. I am also a mom and have dinners to make and laundry to do, bills to pay… a household to keep up and running… and then there is Homesteader’s Supply. I work on the blog, keep the website safe from hackers as best I can, keep up with Google product changes (believe me – this is a HUGE task) and all the geeky stuff with regards to the store. The newsletter was that one thing too many and cost too much to just sit there untouched, so we decided to put that on hold for a while until we could dedicate time to it and figure out what people wanted in a newsletter. This entry was posted in Homesteading, How-To, Random Thoughts on January 18, 2012 by Homesteader's Supply. “I despise a flogging rooster…” is one of my favorite quotes from the movie “Cold Mountain” and for good reason… I DO despise a floggin’ rooster! If you’ve ever gone into the hen house to collect eggs and had a rooster come at you, flapping his wings and leading with his spurs… you know exactly what I mean! My experience has led me to keep a more mellow flock… rooster free if at all possible, however every once in a while a run of pullets will sneak in a rooster or two. I had a rooster last season and ended up with a broody hen and a small batch of chicks.. yep… one is a rooster who has recently started his two o’clock a.m. practice crowing. Three days in a row now I’ve had the pleasure of a three a.m. wake up call from this small boy. So, I get up this morning to see what people are doing with their roosters and find posts about ‘amazing tamales’ or ‘chicken noodle soup’…. hmmmmm thinking soup is sounding pretty good on this rainy day. What do you do with your roosters when you have more than your place needs? Do you try to sell them? Do you butcher them out? I tend not to put the effort into butchering roosters because typically they are quite skinny chested birds… the hens have so much more meat on them, that is unless they are the meat birds and then gender doesn’t really matter. I’m thinking this young man will have a bit more time to figure out that crowing at two a.m. isn’t healthy and if that lesson isn’t learned… he’ll be fodder for the coyote… it’s a nice horse back ride out to state land!!!! This entry was posted in Homesteading, Poultry on January 16, 2012 by Homesteader's Supply. Drinking at the Milking Bar! Milking bars are one of those inventions that really make a difference for dairy farmers – both big operations or just a couple of cows. Often times calves are pulled from momma once the colostrum is consumed, especially in dairies… and rather than using the hand held bottles to feed each calf, milk bars were created to feed many calves at once. I decided to share the wonders of milk bars tonight because we import these items from New Zealand (no, we could not find a USA made milk bar) and the prices are due to go up… apparently because of a weakening US dollar. If you have any interest in purchasing a milk bar for your calves, lambs or goats… now would be a good time before prices increase! This entry was posted in Dairy Cows, Dairy Uses, Milking Bars, Raw Milk on January 4, 2012 by Homesteader's Supply. 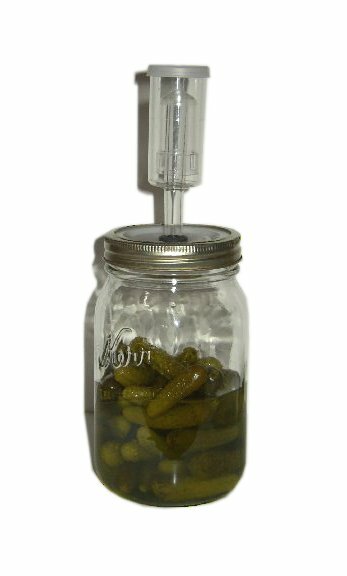 Homesteader’s Supply designed the “Pickle Pro” – a fermenting jar with an airlock to allow gases out without letting air in. These great containers are still available on the Homesteader’s Supply site. We did have some customers who understood the need for a glass container to ferment in, but didn’t want to pay the shipping to get a heavy glass jar across the country. The solution sort of snuck up on us…. create a fermenting seal out of a food grade wide mouth canning jar lid and drill out the hole for the grommet and add the airlock. This new Pickle Pro lid fits any wide mouth canning jar and is ideal for those who don’t necessarily need the gallon jar size. Wardeh, the fermenting wizard with GNOWFGLINS (http://gnowfglins.com/) tested the new air lock system and gave it a thumbs up which made us very happy!!! Our first run of drilling the lids made us realize that the jig needs to be squared up a bit, some of the grommets are a bit off center. This doesn’t change the quality of the product… just gives it a unique twist!!! We did notice that the plastic canning lids that we use for the new fermenting jars have a flaw from the pouring process… we’re working with the manufacturer on a solution but the seal is true even with the small chink in the plastic… best we can figure out, they are from the molding of the lids out of hot plastic. If you have ordered one and have tried it, please let us know how you like it!!!! For those with the original Pickle Pro… let us know how you’re enjoying that product too!! Thanks and wishing all of you a Happy New Year!!!! 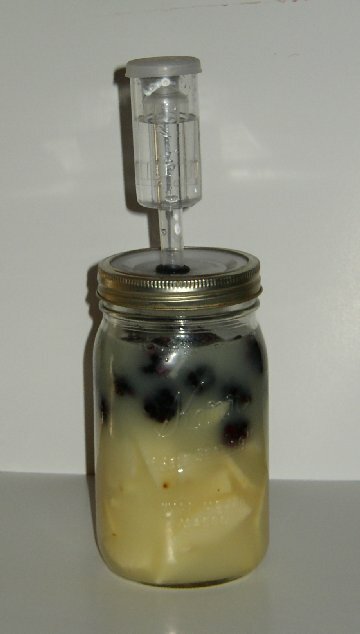 This entry was posted in Canning, Fermentation, Preserving on January 2, 2012 by Homesteader's Supply.